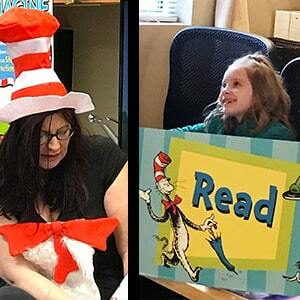 March 2, 2018, Toms River, NJ – Parents in Toms River, NJ joined millions of their peers across the country to celebrate the sixteenth annual National Education Association’s (NEA) Read Across America Day on Friday, March 2, 2018 at American Institute’s annual live reading corner. NEA’s Read Across America Day, which celebrates Dr. Seuss’s birthday and the joys of reading, expected more than 45 million readers, both young and old, to pick up a book and read. To honor Dr. Seuss’ legacy and celebrate the fun and value of reading, American Institute invited parents and children to join NEA and many of America’s leading literacy, youth, and civic groups in bringing a nation of readers together under one hat – the red and white stovepipe one made famous by the Cat in the Hat-for a flurry (or furry) of reading fun at this year’s reading corner at the Toms River, NJ campus. For more information NEA’s Read Across America, visit www.nea.org/readacross and www.readacrossamerica.org and learn of other reading celebrations that are happening from coast to coast throughout the year.